The eight-storey mixed-use condo's use of dark- and light-grey brick with glass-lined windows and balconies adds a very modernist touch to the corner of Dundas West and Manning Avenue. 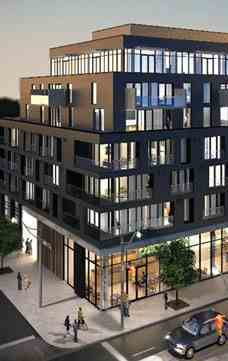 The two-storey-high ground floor creates a dramatic entrance to the condo, as well as ample space for retail vendors. Tucked away behind the mid-rise condo are eight four-storey townhomes, with their wood accents and stylized simplicity adding a homey, midtown feel to balance the hustle-and-bustle of the Dundas and Bathurst neighbourhood.